Dublin City Council has defended its decision to place a concrete slab on one of the capitals most historic streets. The slab, which is intended as a traffic calming measure, has been built beside City Hall, in front of an entrance to Dublin Castle. Re: Legal Complaint  Re: Erection of Concrete Base Structure and No. 3 Flagpoles adjacent to City Hall at Cork Hill, Dublin. Further to our email to Michael Philips City Engineer yesterday and to our telephone conversation this afternoon we thank you for confirming that there has been no consent under Part 8 of the Planning and Development Regulations 2001. 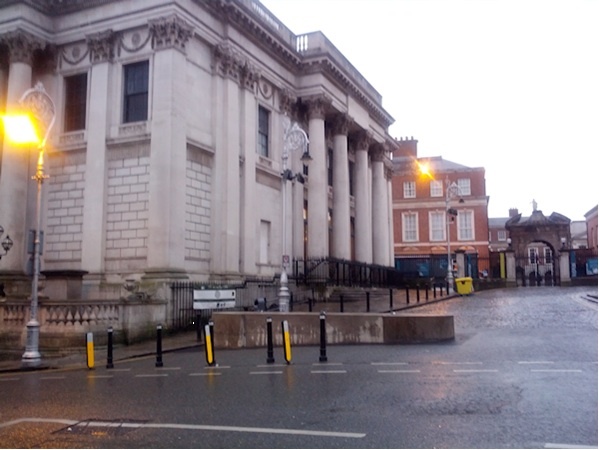 The concrete structure already inserted and proposed flag pole placement is highly injurious to the setting of major protected structures namely the City Hall, main entrance to Dublin Castle and the former Newconem Bank now the Rates Office. This is one of the citys iconic architectural ensembles featuring in a Malton print and State Visit arrivals to Dublin Castle. The main pediment of the City Hall has three flag poles and the Rates Office three on the portico. The insertion of flagpoles on this site is unnecessary and unjustified apart from being visually deleterious. In addition to this the structure erected is a waste of public money. We do not consider any claim that the work is exempt from Part 8 of the Planning and Development Regulations 2001 consent because of sub threshold cost of the project applies and also because of the location of the works affecting major Protected Structures. The claim made by Paul Heffernan Media Relations and Corporate Communications, Dublin City Council, this afternoon that the structure is to provide more protection to pedestrians on this street. City Hall is on the Dublin walk from Trinity to Kilmainham and the left turn from Parliament St can be very busy, the works therefore provide a traffic calming measure. A part 8 wasnt necessary, has no basis. Traffic calming has already been achieved by the erection of the line of black bollards half way across Cork Hill and there is no need for an additional structure particularly the large lumpy intrusive concrete structure inserted. We request that the concrete base be removed forthwith and that no further works proceed. We are also referring the matter to the OPW and Department of Arts Heritage and the Gaeltacht. It really is quite an appalling erection. It's beyond belief - even if you overlook both the lack of planning permission (the most blatant of double standards) and how inappropriate this concrete mess is in this particular location - it is the possibly the most over-engineered traffic redirection solution of all time. Would a 'No left turn' sign and a white line not have done the same job? The plastic bollards they recently put there (before the slab) were already ugly and unnecessary, but surely they were doing this job already. What does the slab add? I have crossed the road there hundreds of times without being hit, nearly hit, or even vaguely impeded by cars turning up off Dame St.
DCC seem intent on slowly eroding every visually appealing, historically interesting or sensibly designed feature left in this city and replacing it with a patchwork of nonsense cobbled together illegally by incompetents. It really is quite an appalling erection. It looks like an appalling erection that toppled over. its strange something do with secuirty more then traffic? Looks like an unfinished handball alley or one of those waste glass bays. These people actively hate the heritage of the city. By the 1930s, plans were discussed in Éamon de Valera's government to demolish all of Merrion Square, perhaps the most intact of the five squares, on the basis that the houses were "old fashioned" and "un-national". They were only saved by Adolf Hitler's invasion of Poland in 1939 and a general lack of capital and investment; the plans were put on hold in 1939 and forgotten about by 1945. What do you expect from the muck savages that run our city, most do not even live in Dublin, much less come from Dublin. This is yet another example of the so-called executive acting in a manner which further damages the fabric and built architecture of my city. The same clowns who expect us to pay a tax on our homes to maintain their outrageous and undeserved salaries. FG and the Labour party have the majority on Dublin City Council. Are these the "these people" you are talking about? I was, a few years ago, at a talk given by a heritage officer of one the Dublin Local Authorities and she lamented the fact that for projects under a certain budget the Roads/Engineering Department did not have to consult the Heritage Division on whether the project would impact on nearby architectural or historical monuments etc. In fact, she stated that she suspected that Roads/Engineering Departments would often deliberately break some jobs up into smaller separate projects so as to avoid the hassle of dealing with heritage issues. It is for this reason that historic stone walls or small stone bridges are often replaced without any account taken of their historic value or importance - or large unsightly concrete barriers erected beside important buildings. He was not allowed to discuss it further. What I find most disturbing is that those whose job it is to protect and enhance the city appear not to have the slightest understanding of the impact that this "thing" has or more likely they simply do not care. As I said muck savages. And these clowns want the Bank of Ireland to hand the College Green building over to them, in the first place they have no conception of the cost of just maintaining the building and I shudder to think what "erections" they could install both inside and outside the building. If you walk from Trinity to Christchurch you will pass literally hundreds of pointless/ugly/badly-done bits of 'work' by DCC. Hundreds of bollards that serve no purpose and actually impede pedestrians, badly patched footpaths, multiple signposts close together (i.e. that could share a pole) or with no signs on them at all, old flag stones and setts randomly replaced with concrete/tar/modern paving in a lazy, patchwork way, businesses allowed to take over the footpath with huge fenced-off smoking areas, trees where there should be no trees, taxi ranks given pride-of-place over potentially attractive public spaces, terribly optimised traffic lights, etc, etc. I could go on. Obviously these things erk me a little. And of course it's just a few steps away from that disgraceful building opposite the Olympia that was put up where that sweet little green area used to be for decades. A decision taken during the Ahern era when the prevailing ethos was that it embarrassing not to have brutal modern buildings because we were big league now and not a backward little agrarian hole any more. Oh no! Same mentality that brought us the "stupid aul pencils" lark. What a fkn peasant. It does not seem too bad to me. I have seen worse eyesores in historic areas in London. If it were a bit higher and longer, then maybe it would be an eyesore. If they put up a decorative concrete fence the same size, would that stop it being an eyesore to those who think it is now? No, I don't believe it would. The photo does not do it "justice" it is even worse in reality, there is no valid reason for it to be there and should be removed immediately.